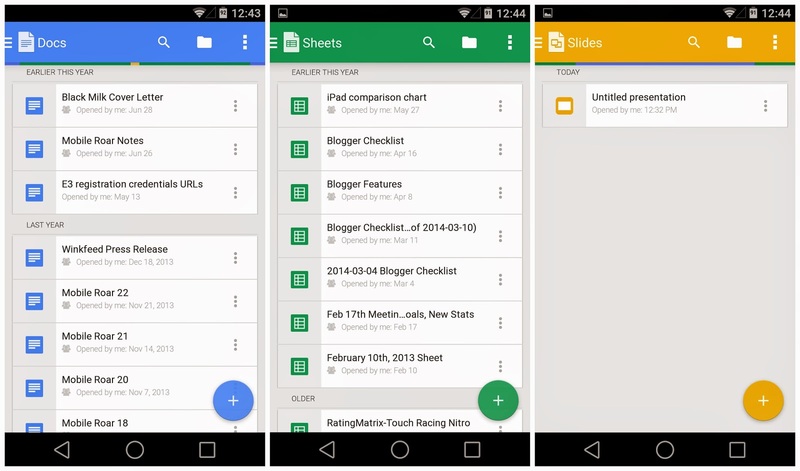 Google has started rolling out a major update to Google Docs and Sheets, partially bringing its new Material Design theme to the apps and greatly enhancing their capabilities and it adds supports for the developer preview of Android L for Nexus 5 or 7. Google had previously confirmed that once the Docs and Sheets app get native Word editing functionality, it would remove Quickoffice from the Play Store. This update is just a step in that direction and brings the ability to natively create and edit Word files in the apps. Other changes include a new account selection picker, a new and faster editor, ability to send files as PDF or Word, a new details page and more. Overall, the updates greatly improves the usability of the apps and should make Android users depend less on Quickoffice for all their office editing needs. Like always, the update will go live on the Play Store over the next few days but you can always sideload the downloaded the APKs from below. We don't have the APK of Slides YET but keep coming again we will have it soon.